…especially being the first in your family to attend and graduate from college. 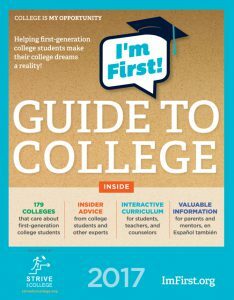 I’m First!, an initiative of Strive for College, is an online community celebrating first-generation college students. Check out video stories from first-gen students, read student blogs and discover colleges that have special programs to support their first-gen students. We feature YouTube video testimonials from first-gen students and graduates from across the country. Watch some below or share your own story. Looking for guidance in applying to college?